Northeast weekend weather: The weekend is shaping up to pretty decent; a welcome change to warmer temperatures especially after dealing with the deep chill during the majority of the week. Notice in the graphic above that the chill will remain throughout the majority of the Great Lakes region and even the interior Northeast. However there is a nice pocket of relative warmth that will be able to sneak northward up along the spine of the I-95 corridor from D.C. to Baltimore to Philly to New York City. So warm in fact that D.C. will climb into the 60s on Sunday. All good things must come to an end as a cooler air mass begins to invade Sunday night into Monday morning. 2009 NFL Pro Bowl: The 2008-2009 NFL season comes to an end this Sunday with the 39th annual NFL Pro Bowl game in Honolulu, Hawaii. Next year, after 30 seasons in Hawaii, the game will move to Miami and will be played the week before Super Bowl XLIV. Although trade winds are not always the predominate wind during the month of January, they will be this weekend. Trade winds blow from an easterly or northeasterly direction. Pop-up, short-lived showers will be isolated in nature but can occur at any time during the game. Still, they will hardly be a hindrance to the game. The drought is growing worse in Texas. 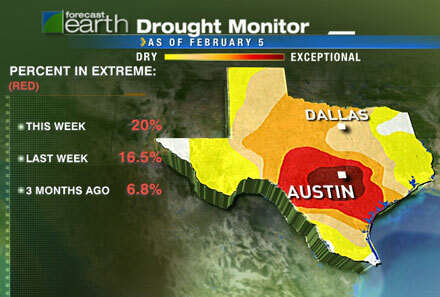 In just three months, the percentage of Texas in an extreme drought has grown from nearly 7% to 20%. Both Austin and San Antonio are squarely within the exceptional drought region; a drought level one factor higher than extreme. Meanwhile, in California, not one portion of the state was considered in an extreme drought just three months ago. 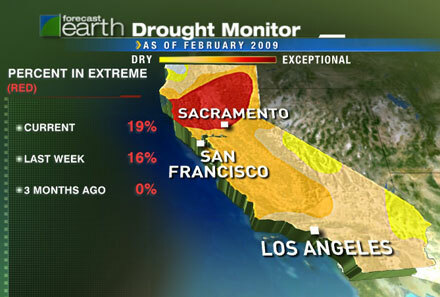 Now 20% of the state, over the northern half, is categorized as being in an extreme drought. 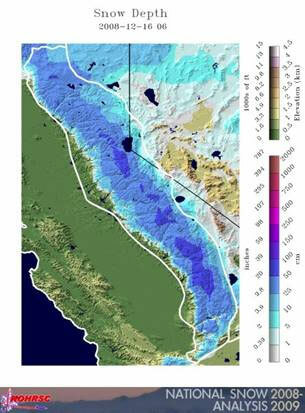 Sierra snowpack is at dangerously low levels. Take a look at the snowpack comparison below from December '08 (just two months ago) to where its at now in early February. The Sierra-Nevada mountain chain really needs a GREAT latter half of the winter season to make up for its lack of snow depth. 2009 Budweiser Shootout: This annual invitation-only event is the unofficial start of the NASCAR season and is always held the weekend before the Daytona 500. The 75 lap (187.5 miles) race kicks off at 8 pm ET Saturday at Daytona International Speedway. Assuming you love warmth and sunshine, if you had to outline what your perfect day would be in terms of weather all you would need to do is point toward the weather at Daytona Beach tomorrow. Blue skies and sunshine will rule overhead with a high temperature near 70 degrees. Absolutely perfect. Enjoy! Today is our dorm's annual fundraiser event known as The Day of Man. All day, 160 guys will be following our motto as true weather warriors: Be cold, be bold, be a man. 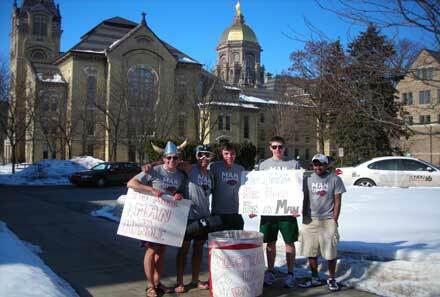 We will be wearing shorts, a Tshirt, and sandals in the bitter cold in order to raise money and awareness for the homeless of South Bend. We will be asking friends and random other students in our classes and around campus for money. We have outdoor stations outside of the dining halls as well as other notable campus buildings. Last year we raised over $6,000 dollars and we are hoping to raise over $10,000 this year. PGA Buick Invitational: It's the second day of the Buick Invitational PGA tournament in La Jolla, California at the Torrey Pines Golf Course. Tiger Woods is the defending champion (he has won 6 Buick Invitationals) but as he continues to rehab and condition his body back to his championship-self, the field at the invitational is wide open this year. Camilo Villegas leads the field after one round of play. Unsettled weather conditions will rule over California today through tomorrow providing rain on each day and leaving the grounds pretty wet and slow. During the last 24 hours (ending at 8 am PT), Torrey Pines picked up anywhere between a 1/3 and a 1/2 inch of rain. Light showers may remain over La Jolla on Sunday as the storm system lingers over the Desert Southwest. The point is that this golf tournament will be mainly played under mostly cloudy skies and occasional bouts of rain. 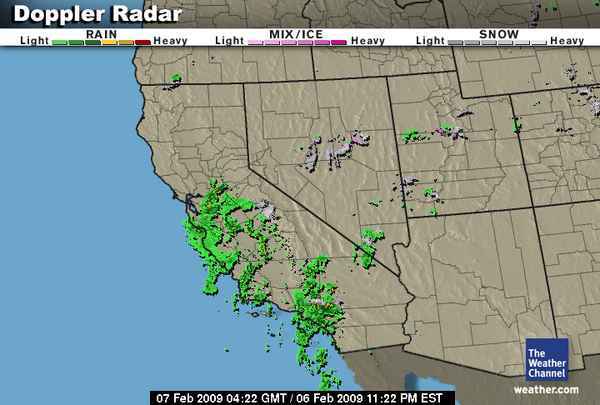 What happened to sunny California? 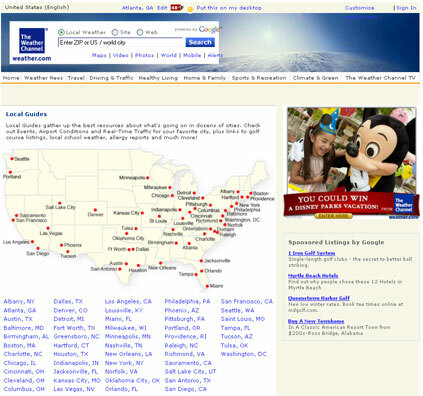 City local guides: Did you know weather.com has 50 city local guides detailing upcoming local events (entertainment/sporting), airport conditions and of course, the weather? Want to know what's going on in New York City, Chicago, or Los Angeles and how the weather will be? Just click on the city name and it'll take you to their local guide. Give it a try. It hasn't been this cold since...: The Atlanta, Georgia, office of the National Weather Service put out an interesting statement regarding the 2008-2009 winter season. Atlanta's low temperature dropped to 16 degrees on both February 4 and 5. This marks six times this winter that the the overnight low has fallen below 20 degrees. This is the most amount of times below 20 degrees since the 2000-2001 winter season (it happened 9 times that season). Moreover, the high temp in Atlanta has remained at or below 33 degrees four times this winter season. Again, the most times since the 2000-2001 winter season. A warm change is in progress, however, as temperatures will climb into upper 60s this weekend. 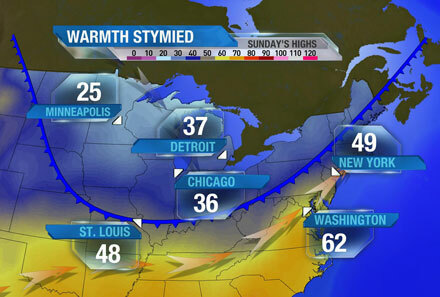 Check out the highs across the Southeast tomorrow! 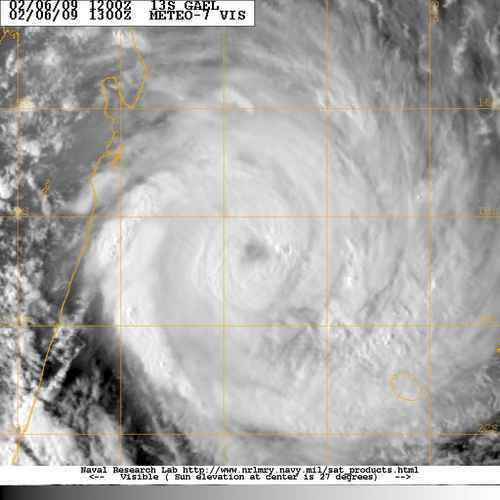 TC Gael is located just off the eastern coast of Madagascar and has top winds of 90 mph. The Joint Typhoon Warning Center is forecasting Gael to reach Category 4 cyclone status by early Sunday. Thankfully, the majority of Gael's rain bands are remaining offshore. Although the forecast track calls for Gael to take a turn toward the south, any farther west and its rainbands will begin to lash the eastern shores. The Weather Channel's hurricane and wave expert Dr. Lyons is forecasting wave heights to climb to 18-22 feet during the next 24 hours along Madagascar's northern and central east coast. We got some rain totals: The rain began across southern California early Thursday morning and it continues today. Here is a list of rain totals from 4 am PT Thursday to 4 am PT Friday. For many locales in this region, this is the heaviest rainfall since mid December (over a month and a half ago). How cold was it? : It's likely tourists and residents alike were not fond of the chill in Key West, Florida, on Thursday. Yesterday's highly only managed to get to 55 degrees; that is very cold for Key West standards. 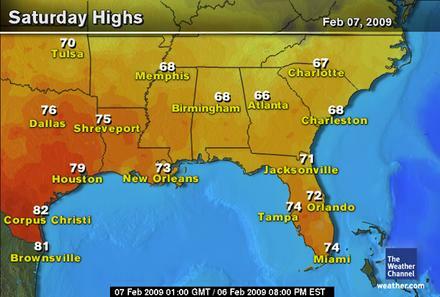 The average high this time of year is 75 degrees (20 degrees below the average). This was the coldest high temperature since Christmas Day back in 1989! Before yesterday, the coldest high during the past 10 years was 56 degrees set on January 24, 2003. No worries, though, as Key West will have a very enjoyable weekend weatherwise. The only hiccup will be the very gusty winds out of the northeast and east blowing at 20 to 30 mph with occasional higher gusts. Small craft will have to take extra care when in the waters around the Keys this weekend. Today is Friday February 6, 2009, the 37th day of the year. There are 328 days left in 2009. Today's weather highlight in history: On February 6, 1980, a low pressure area dumped heavy snow over eastern North Carolina and southeastern Virginia. The storm abated on the 7th and left 12.4 inches of new snow in Norfolk, VA, the city's biggest snowstorm since December 1892. In 1933, the 20th Amendment to the Constitution, which set the date for the president's inauguration on Jan. 20, was adopted. In 1935, the popular board game Monopoly® went on sale for the first time. In 1971, Astronaut Alan B. Shepard hit a golf ball and Edgar Mitchell threw a "javelin" on the moon. They landed in the same crater and remain on the Moon today. In 1978, the "Great Blizzard of '78" struck the Northeast, with southern New England especially hard hit. By the time the storm ended on the 7th, Boston had 27.1 inches of new snow to set an all-time single storm snowfall record. Up to 50 inches fell in northern Rhode Island. Today's Birthdays News Anchor Tom Brokaw is 69, Singer Natalie Cole is 59, Actress Kathy Najimy is 52, Singer Axl Rose is 47, Former MLB relief pitcher Bob Wickman is 40. Get a phone call with severe weather voice alerts. Try Notify! free for a week.